The description in this tutorial is not yet supported by CAD tools due to bus-based routing. Fracturable Multiplier Example for a supported version. Implementing multipliers in soft logic is very area expensive. Thus it is important for modern FPGA architects be able to describe the specific properties of the configurable multiplier that they want to investigate. The following is an example on how to use the VPR architecture description langauge to describe a common type of configurable multiplier called a fracturable multiplier shown in Fig. 37. We first give a step-by-step description on how to construct the multiplier block followed by a complete example. 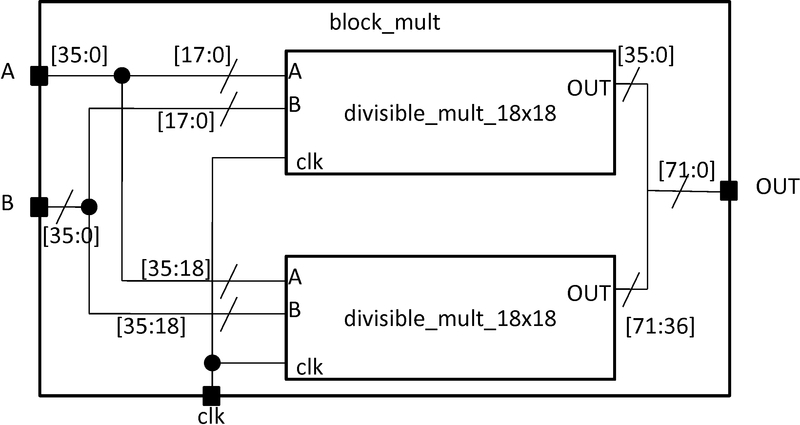 The large block_mult can implement one 36x36 multiplier cluster called a mult_36x36_slice or it can implement two divisble 18x18 multipliers. A divisible 18x18 multiplier can implement a 18x18 multiplier cluster called a mult_18x18_slice or it can be fractured into two 9x9 mulitplier clusters called mult_9x9_slice. Fig. 38 shows a multiplier slice. Pins belonging to the same input or output port of a multiplier slice must be either all registered or none registered. Pins belonging to different ports or different slices may have different register configurations. A multiplier primitive itself has two input ports (A and B) and one output port (OUT). The slice description finishes with a specification of the interconnection. Using the same technique as in the memory example, bus-based multiplexers are used to register the ports. Clocks are connected using the complete tag because there is a one-to-many relationship. Direct tags are used to make simple, one-to-one connections. The mode finishes with a specification of the interconnect between the slice and its parent. This mode has two additional modes which are the actual 18x18 multiply block or two 9x9 mulitplier blocks. Both follow a similar description as the mult_36x36_slice with just the number of pins halved so the details are not repeated.